The Kodåly method is akin to that of Jaques-Dalcroze in that all musical learning must take place via the ear not the intellect. Singing and ear training should always precede that of notation. In our use of the Kodåly method the students learn how to sing the pitches by use of hand signs initially given by the teacher and eventually copied and sung by themselves. A number of simple melodies are used and then part singing is encouraged by the singing of rounds. 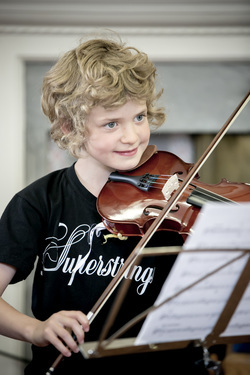 The Dalcroze method which we use in Superstrings is a learning of music through experience. This is an approach which tends to awaken the senses rather than learning via an intellectual approach. In order to put this into practice we learn using games, improvisation and movement creativity, stimulated from a musical source. This enables the students to internalize rhythms and perform using the whole person thus when transfered onto their instruments making them able to perform in a more convincing and confident way. Most importantly they learn and enjoy!